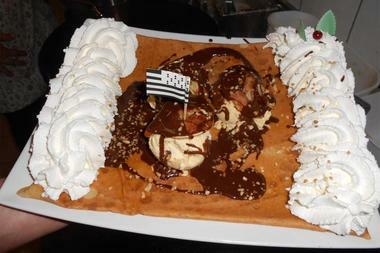 Come along hungry to Entre Terre et Mer -by Landereau’s famous lived-in bridge – and enjoy a generous galette. 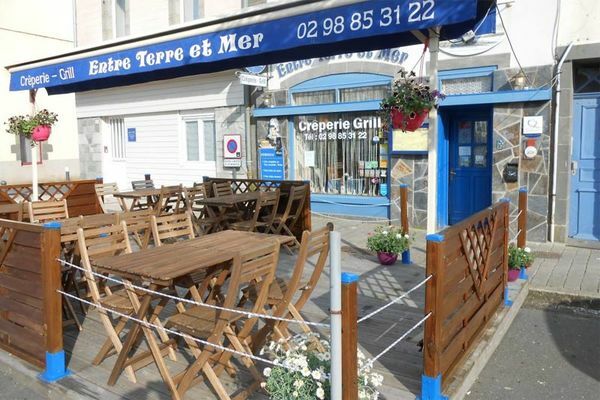 You’d better have a healthy appetite when you eat at Entre Terre et Mer. “You've been warned, the Galette Garguantua isn’t called that for nothing!” laughs Michel Guillou. Are you ready? So here’s what it is - a buckwheat pancake topped with ham, egg and cheese. Nothing unusual so far, except that this first pancake is folded and then covered with a second pancake filled with mushrooms, tomato sauce, onions and lettuce! Anyone still got room for a ‘Montagnarde’ - buckwheat pancake with raclette cheese, potatoes, fresh country-style ham and sausage? Ok, so perhaps you’d prefer a ‘Duchesse Anne’ – a sweet crêpe laid out in the shape of a veil propped up with balls of vanilla ice cream, Chantilly cream and praline. A nice walk to see the lived-in bridge and you'll be ready to start all over again!